Carry the electronic key to enable this function. 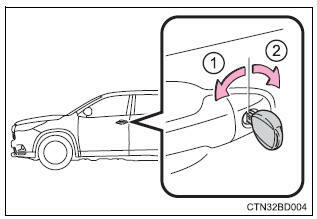 Grip the driver's door handle to unlock the door. Grip the passenger's door handle to unlock all the doors. * Make sure to touch the sensor on the back of the handle. The doors cannot be unlocked for 3 seconds after the doors are locked. *: The door unlock settings can be changed. Touch the lock sensor (indentation on the upper part of the door handle) to lock all the doors. Press the unlock button to unlock all the doors. Press the lock button to lock all the doors. Pressing the button unlocks the driver's door. Pressing the button again within 5 seconds unlocks the other doors. Press and hold to open the windows and moon roof. * (ƒZƒn183) *: This setting must be customized at your toyota dealer. Unlocks the door turning the key unlocks the driver's door. Turning the key again within 5 seconds unlocks the other doors. Turn and hold to open the windows and moon roof. * (ƒZƒn183) *: this setting must be customized at your toyota dealer. The doors can also be locked and unlocked with the mechanical key. 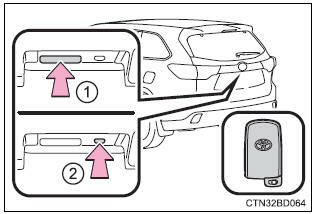 windows and moon roof: a buzzer sounds to indicate that the windows and moon roof are operating. If a door is not opened within approximately 60 seconds after the doors are unlocked using the entry function or wireless remote control, the security feature automatically locks the doors again. If an attempt to lock the doors using the entry function or wireless remote control is made when a door is not fully closed, a buzzer will sound continuously for 5 seconds. Fully close the door to stop the buzzer, and lock the doors again. If a door is not fully closed and the wireless remote control is used to lock the doors, the doors other than the open door will be locked. The open door will be locked after it is fully closed. If the wireless remote control is used to lock the doors while the power back door is closing with all side doors fully closed, the side doors are locked. The back door will be locked when it is fully closed. 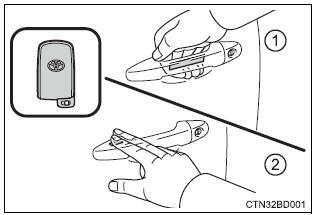 If the wireless remote control is used to lock the doors while the power back door is closing with all side doors fully closed, a buzzer will sound and the emergency flashers will flash to indicate that the reservation lock is activated. At this time the side doors are locked. The back door will be locked when it is fully closed. Locking the doors will set the alarm system. Vehicles with a smart key system: use the mechanical key to lock and unlock the doors. Replace the key battery with a new one if it is depleted.